I've been living in the Blue Mountains for four years now and I am really excited about the possibility that there are secret underground military bases beneath my house and the new library and Coles supermarket in Katoomba. I'm giving this site an Encouragement Award because I want to know how the research is going and if any progress has been made in mapping the entrances to the complex. I realise that my old eyes probably won't be able to see the aircraft moving at almost the speed of light, but I would love to be able to take a tour of the hangars and other buried facilities. I'll even promise not to take pictures and put them on Facebook or Flickr. The cliffs behind my house. Where are the hidden doors? The country here is elevated 2800 feet above the sea. About a mile & a half from this place there is a view exceedingly well worth visiting; following down a little valley & its tiny rill of water, an immense gulf is suddenly & without any preparation seen through the trees which border the pathway at the depth of perhaps 1500 ft. Walking a few yards farther, one stands on the brink of a vast precipice, & below is the grand bay or gulf, for I know not what other name to give it, thickly covered with forest. The point of view is situated as it were at the head of the bay, for the line of cliff diverges away on each side, showing headland behind headland, as on a bold Sea coast. 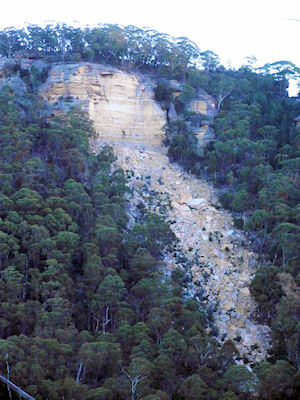 These cliffs are composed of horizontal strata of whitish Sandstone; & so absolutely vertical are they, that in many places a person standing on the edge & throwing a stone can see it strike the trees in the abyss below: so unbroken is the line, that it is said to be necessary to go round a distance of sixteen miles in order to reach the foot of the waterfall made by this little stream. — In front & about five miles distant another line of cliff extends, thus having the appearance of completely encircling the valley; hence the name of Bay is justified as applied to this grand amphitheatrical depression. — If we imagine that a winding harbor with its deep water surrounded by bold cliff shores was laid dry, & that a forest sprung up on the sandy bottom, we should then have the appearance & structure which is here exhibited. The class of view was to me quite novel & extremely magnificent. It is still extremely magnificent and largely untouched by signs of man, but I have been advised that underneath things are not so original. Apparently there are secret underground military and technology bases used to exploit alien technology, and not only that, people have been abducted by aliens from around here. I learnt all this from a magnificent web site put together by ace UFO researcher Rex Gilroy (famous also for his work chasing the strange and almost mythical beasts which populate the eucalypt forests but cleverly hide themselves from scientists and the many bushwalkers who use the area for recreation). Rex & Heather Gilroy operate the "Blue Mountains UFO Research Club" and the recently formed "Centre for Blue Mountains UFO Studies. They are the foremost investigators of the Top Secret Underground Advanced Space Technology Base, being operated jointly by the Australian and American governments. The subject of this section is "Blue Mountains Triangle", and contains material from the Gilroys' forthcoming book celebrating my 50 years of UFO research achievement titled: "Blue Mountains Triangle — UFO Close Encounters, Alien Abductions and the Underground UFO Base Mystery". 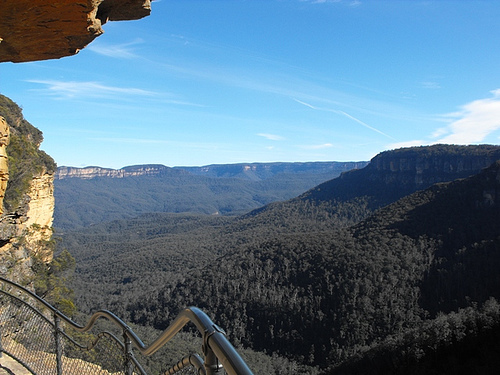 Besides the vast number of UFO sightings, the Blue Mountains continues to be one of the world's major UFO 'hotspots'. Our "Blue Mountains UFO Research Club" has recorded hundreds of sightings reports in some years. A great many of these reports appear to emanate from the Burragorang Valley south of Katoomba, and the equally vast Wollemi wilderness to the north. Yet there is a more sinister aspect to the Blue Mountains UFO mystery which has persisted for generations; for it is a region where aircraft and people have mysteriously disappeared, where ET abductions occur. And, while many abductees have been released, others have not. There is also another mystery pervading this wilderness, and one upon which I have, together with Heather, investigated for 35 years — the top secret American-Australian joint underground, advanced space travel technology base. It is an incredible operation in which NASA is involved alongside US military, together with Australian scientists and military. It is an operation also involving thousands of other personnel and their families, living in an incredibly vast, underground world with its own self-sufficient colonies, or rather towns and other, more city-like habitation centres with their own economy, ruled over by a leader whose very name is not mentioned above ground. All this is watched over from above by the FBI, CIA and our own ASIO; undercover representatives of which live in the Sydney district as well as on the Blue Mountains. The subject is just far too complex to reveal in full, so I intend to concentrate upon a selection of the more mysterious aspects of the mystery. The 'Triangle' roughly covers an area beginning north of the Blue Mountains, extending from the Gulgong district in the north-west, eastwards through the Denman and Singleton districts to the Branxton-Maitland area. From Gulgong the western side of the 'Triangle' extends southward to the Goulburn area, and from here the eastern side of the 'Triangle' extends northwards through the western side of the Southern Highlands and on through the Mulgoa-Penrith area to Maitland. It is within this 'Triangle' that the mysterious incidents covered in this talk have taken place. The relevant authorities remain tight-lipped on all the UFO-related events hereabouts. If I drive to the end of my road I can see into the Burragorang Valley, so I am starting to worry. What if the aliens come for me? What if they take me into one of these underground facilities and "our own ASIO" looks up their files and finds out that I was a protestor against the Vietnam War? (I was also a conscripted soldier, so don't bother calling me names.) What if they find out that I didn't fill out the departure documents properly when I returned to Australia from the USA in 1987? What if NASA finds out that I haven't updated my Windows wallpaper with the latest Astronomy Picture of the Day? Now I know why Cody The Religion Hating Dog starts barking for no apparent reason in the middle of the night - he is detecting the hypersonic sound of flying saucer exhausts. There is the story that back in 1973 a young government employee in Canberra, discovered reams of paper that had been dumped in an office waste paper basket. A casual glance revealed row upon row of sets of mathematical numbers and symbols. He rescued the pages and later showed them to a mathematician friend who remarked that they appeared to form some kind of "scientific language". Eventually an astronomer to whom he showed the pages looked at them, literally turned pale and told him to get rid of them. "They are top secret messages and if you're caught with them you will be in big trouble", he told him. However, the young man passed them on to another associate, we'll call him 'Mr West', whose mathematical skills enabled them to obtain information from the rows of figures. 'Mr West' informed this author in 1974 that, the translation obtained from the figures revealed directions on how to construct a flying craft somewhat like a giantsize F111 fighter plane, only that this craft was meant for space flights. "We constructed a scale model and tested it in a wind tunnel. According to the information, the craft was able to travel at the speed of light. The craft was to be nuclear powered. The spacecraft was supposed to have a laser-type ray that could destroy any attacking airship. It could produce a protective forcefield around it and was designed to take off and land like an ordinary aircraft. The 'mathematical language' spoke of experimental three-stage giant spacecraft, and also a 'saucer' type craft for space travel, which like the other two, was to be deployed from underground launching sites in the Blue Mountains and the Hinterland mountain range on the Queensland side of the New south Wales border. The documents also spoke of the camouflaging of the launching sites, which consisted of huge sliding doors covered by a thick layer of soil topped with rocks, trees and shrubbery. We realised that this information was 'dynamite'. I let my friend take the documents and hide them somewhere safe, but he later disappeared without trace", said 'Mr West'. These 'top secret' documents containing the 'mathematical language', so carelessly and no doubt accidentally discarded in a wastepaper bin, were obviously the communications of advanced scientific minds, passing on highly-advanced spaceship technology information otherwise unavailable to Earth space scientists back in the early 1970s and officially still is for that matter there. Well, I'm convinced, although I wonder why the Australian government pays so much for imported military aircraft when we have the plans for a giant fighter that can travel at the speed of light. We have lots of uranium for the nuclear power and lots of cliffs to hold camouflaged hangars, so what are we waiting for? What convinces me even more is that I believe I have discovered one of the secret adits to the underground bases. I took a different route home from work the other day and I saw a disruption in the geology that suggests that one of the secret "huge sliding doors covered by a thick layer of soil topped with rocks, trees and shrubbery" had been moved, disturbing the surrounding bush. I stopped to take a photograph and I don't think it was a coincidence that two cars came very close to me as I was walking back to my car with my camera in my hand. They were obviously warning me, although whether they were trying to kill me or just frighten me into dropping the camera and running is not known. I know I won't be driving down that road again for a long time. I can't tell you where I took the picture because then I would have to kill you (if the disappearers don't get to me first), but I will say that a line drawn parallel to the face of the "cliff" passes through Wollemi and a line vertical to the "cliff" passes through the southernmost part of the Burragorang Valley. That is probably all I can say without placing all of us at risk.